Winter cooking is all about root vegetables, cutting back a bit on meat, and making big pots of soups and stews to serve up by the bowlfuls to friends or freeze for another day when I don’t feel like cooking from scratch. 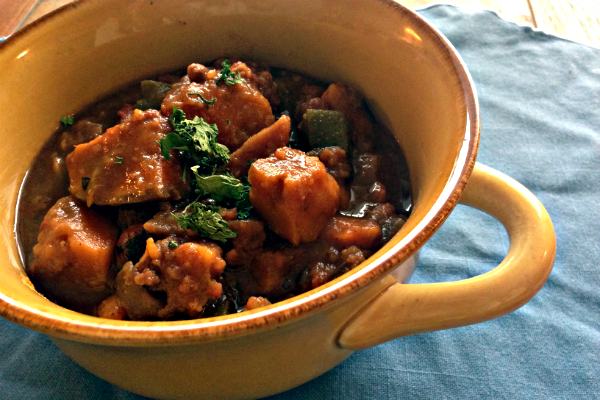 When this sweet potato chili came across the transom from Family Circle, I was intrigued. It’s a slow cooker recipe, too. I don’t have a fancy slow cooker. I have a 1970s orange-yellow slow cooker with a missing knob. It’s nothing like the squat, chrome-trimmed counterparts of today’s slow cookers, but I like the Danish modern style of my simple cooker, despite its major flaw. “That’s OK,” my mom told me when it ended up in my kitchen, after we had cleaned out my dad’s house when he passed. “Just use a screwdriver to adjust the heat. Slow cookers only have three settings: low, medium, and high.” But I haven’t had much inspiration to test her theory, especially since I can’t really tell which setting it’s on. 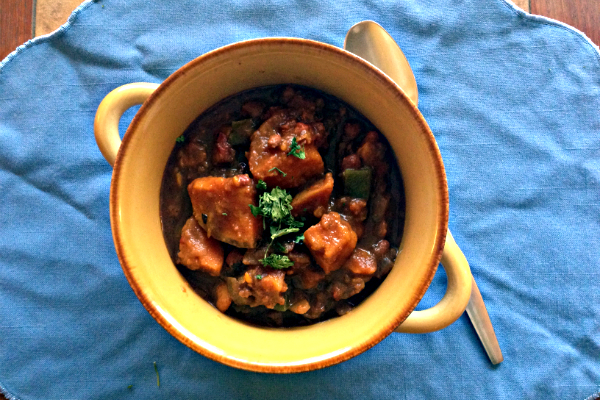 But for a slow-cooker sweet potato chili recipe, I figured not too much could go wrong – it’s not like you can ruin sweet potatoes and pinto beans. So I thought I’d just let the slow cooker do its thing and then determine if we could have a working partnership. As for the recipe, I couldn’t find the “jalapeno-seasoned petite diced tomatoes” that the original recipe calls for, so I just cut up a half a jalapeno and tossed it in with everything else for what seemed like an eternity (basically all day). If you like your chili hot, add more. I have now been eating sweet potato chili for a week straight, even after feeding two other friends one Sunday, packing it for lunch at work, and freezing more. There is still a big helping in my ‘fridge. I like the sweet potato base of the this chili, with its lingering heat from the jalapeno and cayenne pepper that tingles the lips – just the thing one needs when something as intimidating as the Polar Vortex is swirling outside in the dark night. The orange-yellow slow cooker may have just proved its bright spot in my kitchen. 1. Coat slow-cooker with nonstick cooking spray. 2. Layer sweet potatoes, onion, green pepper, garlic, and pinto beans in slow cooker. Combine the rest of the ingredients, except for the cilantro, in a medium-size bowl. Pour over vegetables. 3. Cover and cook on high for 6 hours, or low for 8 hours. 4. Stir in cilantro and serve chili over brown rice.